The U.A.E. is deeply involved in the Saudi-led war in Yemen, a war that faces widespread international criticism for airstrikes killing civilians and the conflict pushing the country to the brink of famine. The document says: “We resolutely declare that religions must never incite war, hateful attitudes, hostility and extremism, nor must they incite violence or the shedding of blood.” The statement also says countries have a duty to establish a concept of “full citizenship.” The U.A.E. relies heavily on foreign laborers who have no path to naturalization. Before he addressed the inter-religious meeting, Pope Francis was given a royal welcome here. His small car was flanked with a guard of honor on horseback, with air-force planes flying overhead, as he proceeded to the presidential palace for the colorful state welcome and subsequent private conversation with the crown prince. 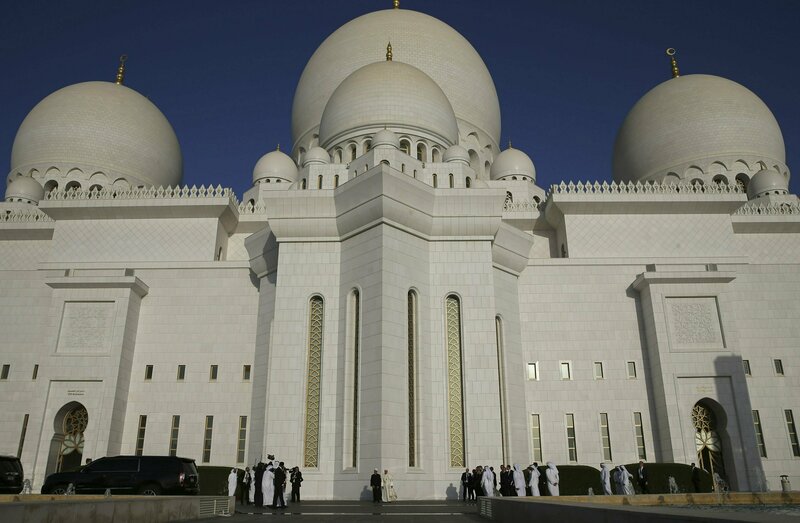 This was followed by an important behind-closed-doors encounter with the international Muslim Council of Elders in the courtyard of the Great Mosque of Sheik Zayed, one of the largest and most ornate mosques in the world. He continued in Italian, with simultaneous translation in Arabic, by first thanking his hosts—Sheik Zayed and the Grand Imam, who had spoken before him. He also extended his greetings “with friendship and esteem, to all the countries of this peninsula,” which include Saudi Arabia, Bahrain, Oman and Yemen. He told these representatives of the world’s religions that “human fraternity requires of us the duty to reject every nuance of approval from the word ‘war.’” He drew their attention to “the fateful consequences” of war that are visible to all in Yemen, Syria, Iraq and Libya. Pope Francis thanked God for enabling him to come here on the eighth centenary of the meeting between St. Francis of Assisi and Sultan al-Malik al Kāmil of Egypt. Though the pope did not say so, that encounter took place during the fifth crusade. Francis visits the U.A.E.’s Muslim leaders also at a time of conflict—the war in Yemen. “I have welcomed the opportunity to come here as a believer thirsting for peace, as a brother seeking peace with the brethren. We are here to desire peace, to promote peace, to be instruments of peace,” he told his audience. “No violence can be justified in the name of religion,” the pope said. He emphasized that “religious freedom” is part of such freedom. He went onto affirm that “justice is the second wing of peace.” He told his interreligious audience: “No one can believe in God and not seek to live in justice with everyone, according to the Golden Rule” that is common to all religions. He said, “Peace and justice are inseparable! Where is our regard for the sanctity of life in Yemen? Pope Francis, however, reminded his audience that “indifference” is “an obstacle to development” because it “prevents us from seeing the human community beyond its earnings and our brothers and sisters beyond the work they do. Where can I find a copy of Pope Francis' talk? I would like to have a copy for reference. There is just One, Single, Solitary book of legends and fables is the total evidence for your gods???~!! The world is indeed blessed to have Pope Francis and Ahmed el-Tayeb emerging in history at the same time. May we find in them a blessing and a promise for tomorrow. In life they can do a lot. We need to pray for the well-being of all religious leaders. I read this and I want to punch something. Pope Francis you mean none of this. You prize the golden rule but treat your sisters called to the same ordained priesthood as you like liars or fools. You decide they must be confused rather than admit you have no biblical grounds to keep women from the same basic human right to answer their genuine call to ordained priesthood that you freely enjoy. Until you ordain the women called to priesthood in our church and cease forbidding us all to openly debate this issue with you and all bishops, this speech just makes you a hypocrite. I keep thinking this would be a great speech but too bad he does not mean any of it. Too bad he won't do any of these great words. It is so easy to talk the talk but give me a just doer of goodness over one who talks but does not act like he speaks. Thank you for "letting Dubai" in. The US media has barely mentioned the Pope being there praying with other Christians and engaging as equals, with Muslims.Apparently the only time Christians can be depicted in the Middle East, is if they are victims of Muslim crimes. And of course Muslims only if they are warring.This goes against all Islamophobic propaganda.